The newly elected Lithuanian World Community Council (2015 ā€“ 2018). The XV Lithuanian World Community Congress (Pasaulio LietuviÅ³ BendruomenÄ—s (PLB) Seimas) was held at the Lithuanian Parliament House July 14 - 17, 2015 in Vilnius. The Lithuanian World Community encompasses all Lithuanian Communities dispersed throughout the world and its governing body is the Seimas (Congress), which currently meets every three years and elects the Community Council to deal with everyday issues. Attending were about 150 delegates from 33 Lithuanian Communities around the world. The Australian Lithuanian delegates attending the PLB Seimas were EglÄ— Å½iÅ¾ytÄ— - Garrick (leader), Romas Cibas, Irena StumbrienÄ— and Antanas Ä�ibiras (standing in for Australian Lithuanian Federal Executive president, who could not attend). There were four days of deliberations during which matters of concern to Lithuanians throughout the world were discussed. 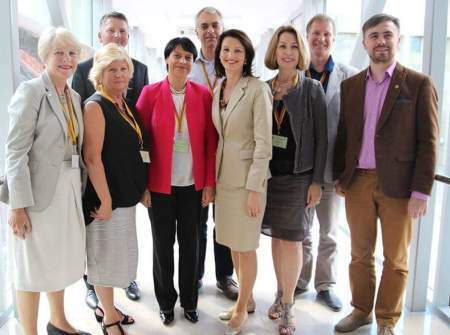 Dalia Henke from Germany elected as President of the Lithuanian World Community Council for 2015 - 2018. Australia was honoured with EglÄ— Garrick elected to head the Finances & Fund Raising Commission. Australia was also honoured by being entrusted to raise the flag before the first Seimas session at Lithuania's Parliament House. Another instance of Australia's strong participation at the Seimas was Romas Cibas elected to head the resolutions committee and being tasked to be one of the four speakers during the forum on the future of PLB.